LONDON, United Kingdom -- Providing high-quality audio amplification performance and simple system control to an array of vertical markets, HARMAN's JBL today debuted the CSA-2120 power amplifier at PLASA 2011. 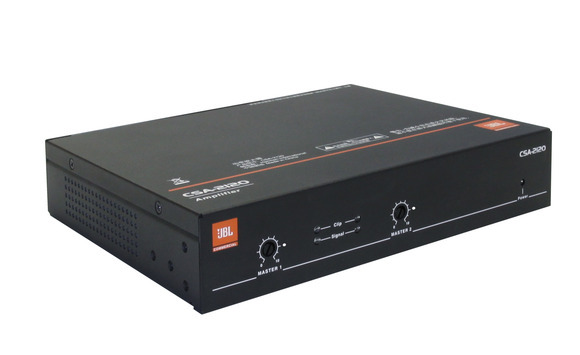 The 2-channel amplifier provides simple front-end amplification and a switch mode universal power supply. "Adding a powerful, small form factor, convection cooled amplifier to our CS Commercial Solutions Series lineup is a significant step forward in providing a host of markets with high-quality and affordable audio solutions," stated Daniel Saenz, Install Business Segment Manager, Crown. "The CSA-2120 provides accurate, uncolored sound with low distortion for both audio and voice applications." An auto-standby mode allows the amplifier to save energy by disabling the amplifier pulse width modulation generator when there is no input signal. The CSA-2120 also features thermal and low-voltage auto protection. The amplifier includes two optional accessories, a mounting kit and transformer module. The mount kit allows for installation into a cabinet or wall and if a loudspeaker system requires higher impedance, the transformer module can be connected to obtain impedance matching. The CSA-2120 has a power rating of 4 ohms/8ohms at 120 watts and weighs only 2.9lbs.